For the blue cheese béchamel sauce: In a saucepan, melt 8 tablespoons of butter over medium-low; you don't want the butter to burn. Add the red chili flakes (if used). Bring the heat back up to medium-high (the butter should be hot and golden) and add the flour. Keep stirring manually with a whisk for approximately 3 minutes. The flour should absorb the butter and form a paste. Stir well until incorporated and add the milk in 3 stages. Increase the heat while constantly stirring for about 5 minutes. Add 4 ounces of blue cheese and reduce the heat to low. Once the cheese is melted and well incorporated, season with salt and pepper. Let the sauce rest until it's time to assemble the dish. Prepping the pears: Peel, core and cut the pears in small wedges. Place the pears in a bowl and coat them in lemon juice to prevent oxidation of the fruit and drizzle with honey and 1 tablespoon of olive oil. 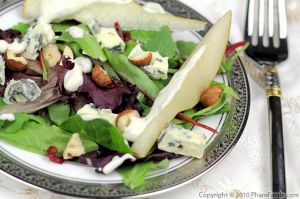 Remove the remaining blue cheese from the refrigerator 15 minutes before serving to bring it back to room temperature. On a hot, un-greased pizza stone, re-heat the flat bread, one at a time, for about 20 seconds on each side. Spread the blue cheese béchamel sauce onto each flat bread. Sprinkle with caramelized onions. Let cook until the bread harden a bit. Remove from the heat. Garnish with salad greens. 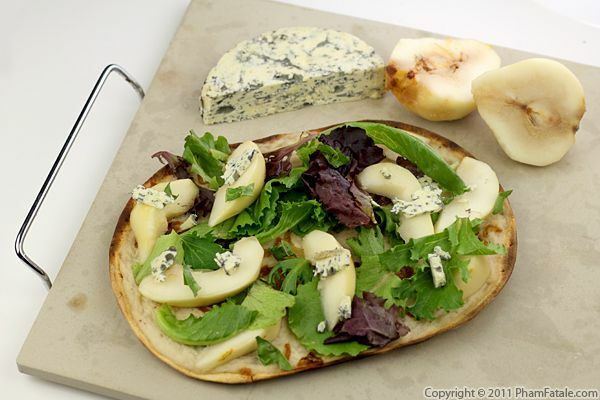 Top with the pears and sprinkle with crumble blue cheese. I used Fourme d'Ambert, which is a raw cow's milk cheese. The cheese has a firm texture with a strong flavor. 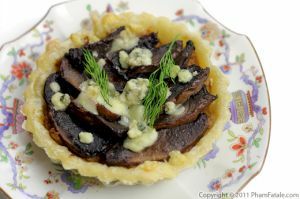 You could use Gorgonzola cheese, Saint-Agur blue cheese, Bleu d'Auvergne or Roquefort as well. 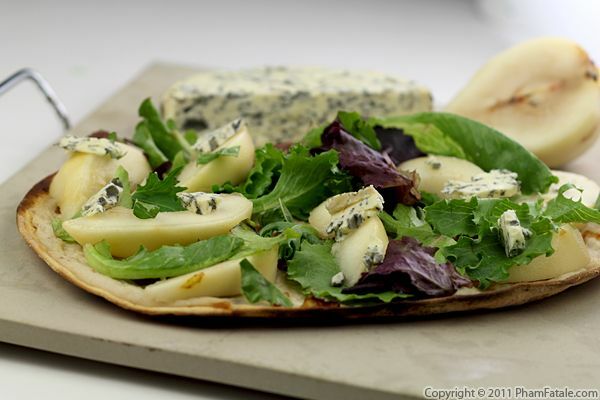 If you like to use other cheeses, you could pair the pears with chèvre (goat cheese) or feta cheese. If you decide to go with milder cheeses, you might want to add salt. To make the cheese sauce, all the ingredients should be at the same temperature, so be sure to heat the liquid in the microwave (or in a saucepan) for about 2 minutes, so it's warm. If you get lumpy pieces in the sauce, don't hesitate to use a hand blender. How to caramelize onions: Heat about 1 tablespoon of olive oil in a non-stick pan. Add thinly sliced onions. Cook over medium-low heat for about 10-15 minutes, stirring frequently to prevent the onion from burning, until the color is evenly golden brown. To save time, I often have already-caramelized onions on hand in the freezer. I suggest making them in advance in large batches. Just place about 1 tablespoon of tightly packed fried onions per slot in an ice-cube tray and freeze. Transfer the ice-cubes into sealable plastic bags and place back in the freezer. I think it's the best way to maintain the same flavor without getting freezer burn. The salad greens add freshness to the pizza. You could replace with baby spinach leaves or simply omit them. If you have any sauce left-over, don't discard it. Just store it for later and use it as a sauce for a croque-monsieur sandwich (ham and cheese sandwich). 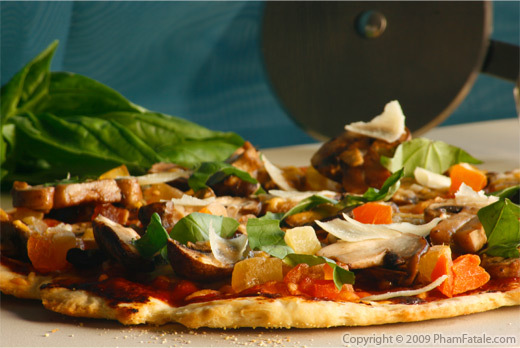 Walnuts (or any nuts) are also another common ingredient paired with pears and they could also add crunch to the pizza. You can also serve the mini-pizzas as appetizers. It's a great time-saver and this dish is perfect when you throw a casual, buffet-style party. Summer is almost over, so take advantage of the warm weather and make good use of your barbecue. You can grill the flat bread on the outdoor grill. Heat a pizza stone (or place the bread directly on the grill), close the barbecue and wait for a few minutes so the blue cheese sauce gets warm. Published By: Jacqueline Pham on August 23, 2011.